The recipe for crab fritters was originally shared by Tito from France. The fritters are similar to crab cakes. They are made with a mix of fish (Tito used grouper but you can substitute any white fish) and crab meat. There is a lovely sauce for dipping the fritters. It is a simple mix of mayonnaise, yogurt and lemon. A nice light sauce for the crunchy fritters. For the sauce, mix the grated rind of lemon and the yogurt in a bowl. Add the lemon juice, salt and pepper. Leave it aside. Mix the grouper fillet, the egg white, salt and pepper in a bowl. Add the fresh cream, and place the bowl in a bigger container full of ice-cubes. Incorporate the crab and the chives. Form 3 cm (just over 1") round balls and coat them in bread crumbs. Press down a bit if you want. Fry the fritter 4 to 6 minutes in very hot oil. Add salt and pepper to your taste. Eat hot, topped with the mayonnaise, yogurt and lemon sauce. 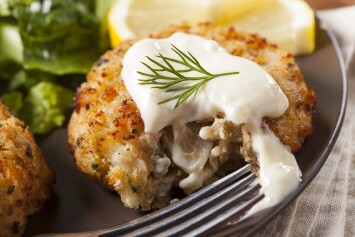 If you like these crab fritters, you will find recipes like fish cakes and crab cakes here.